Looking for deals in Newcastle upon Tyne? Offering a 24-hour fitness center, Hampton by Hilton Newcastle is located in Newcastle city center, opposite Newcastle Central Station. Free WiFi access is available throughout. It’s central location, nice & tidy rooms. Good value for money. This boutique Newcastle hotel offers quirky, 4-star accommodation a 2 minute walk from Central Station. Awesome bathroom And great shower. Very clean. Staff super nice and friendly. They even mailed my postcards for me! Located adjacent to Newcastle International Airport and the Metro rail station, The Doubletree by Hilton is only 10 minutes' drive to Newcastle city center. The staff are excellent and make the stay very comfortable. With a sports bar and grill restaurant, this hotel has a fitness center and modern rooms with free Wi-Fi. Sandman Signature Hotel Newcastle is next to St James’ Park, home of Newcastle FC. Rooms were excellent and the location is perfect, staff were great too! Jurys Inn Newcastle is in the city center, 1640 feet from Newcastle Train Station. It has large and light rooms with attached bathroom with power showers. We had a fabulous stay at Jurys Inn, Newcastle Upon Tyne. 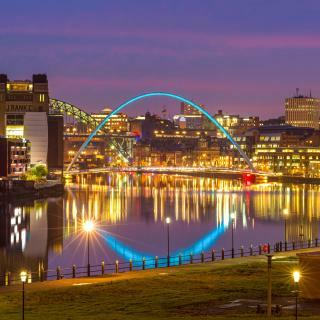 Village Hotel Newcastle is just 15 minutes' drive from Newcastle city center. The hotel offers luxurious rooms and an extensive spa and leisure club with a 25-yard pool. The room was excellent very clean comfortable & roomy. 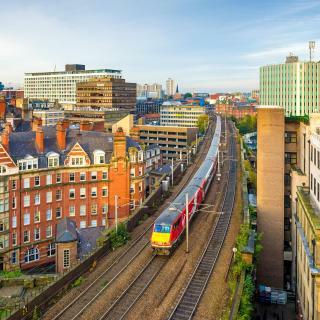 Royal Station Hotel is well-located in the heart of Newcastle city center, adjoining Newcastle Train Station and the Metro system. Location, comfort, perfect for a brief stay. With free WiFi and access to a fitness center, the Novotel Newcastle Airport Hotel contains a stylish restaurant and bar. Great location. Great beds. Great linen. A stylish air-conditioned hotel just 330 yards from Newcastle Train Station, within a 2 minute walk of the central bars and restaurants. Best hotel experience we have in UK. 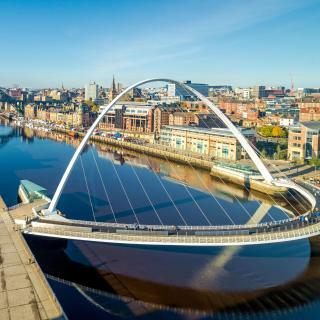 Overlooking the River Tyne and the Millennium Bridge, the Jurys Inn Newcastle Quays is just 2 minutes’ walk from the Baltic Center for Contemporary Art. The location was perfect for everything. The 4-star Gray Street Hotel offers boutique rooms with luxury linens and individual feature walls. The hotel is in Newcastle center, a 2-minute walk from the Theater Royal. Free WiFi is provided. Friendliness of the staff, cleanliness of the rooms and the city centre location. With a stylish bistro and sun terrace, Caledonian Hotel offers spacious rooms with free Wi-Fi. The hotel is in the cosmopolitan Jesmond area, just a mile from the center of Newcastle. The staff were very helpful and the bed was comfortable. The Keelman and Big Lamp Brewery is located in Newcastle upon Tyne, 4.1 miles from MetroCentre, and has a garden and a terrace. Phillip, the manager, and all the staff are INCREDIBLY polite. The Vermont is Newcastle's only 4-star independent hotel. Located next to The Castle, overlooking Newcastle Cathedral and both the Tyne and Millennium Bridges, it has a modern gym, free Wi-Fi and free... All the staff we dealt with were extremely helpful and friendly. Set in a leafy residential street, The Townhouse Hotel offers boutique accommodations in the Gosforth area of Newcastle upon Tyne. Free WiFi access is available and on site parking is possible. The staff were extremely welcoming and went above and beyond to help. Set in 18 acres of grounds, Holiday Inn Newcastle Gosforth Park is next to the A19/A1 (North). Only 6 miles from Newcastle center, it is within easy reach of the beautiful Northumbrian coastline. Excellent service, pleasant staff, super room and good food. Highly recomended. A 10-minute drive from Newcastle Racecourse and less than 20 minute drive from Newcastle Airport, this Premier Inn hotel has free parking and family-friendly rooms with private bathrooms. Location outside the city was good. How much does it cost to stay in a hotel in Newcastle upon Tyne? On average, 3-star hotels in Newcastle upon Tyne cost $82 per night, and 4-star hotels in Newcastle upon Tyne are $114 per night. If you're looking for something really special, a 5-star hotel in Newcastle upon Tyne can be found for $144 per night, on average (based on Booking.com prices). 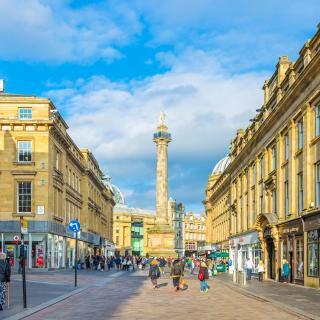 Which neighborhood is the best one to stay at in Newcastle upon Tyne? Newcastle Airport, Newcastle City Center, and Jesmond are popular with other travelers visiting Newcastle upon Tyne. 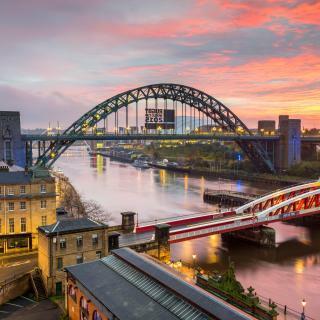 Which hotels are the best ones to stay at in Newcastle upon Tyne? Motel One Newcastle, Crowne Plaza Newcastle - Stephenson Quarter, and Hotel Indigo Newcastle are some of the popular hotels in Newcastle upon Tyne. What are the best hotels in Newcastle upon Tyne near Newcastle Airport? 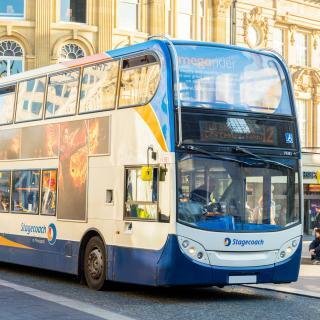 Travelers who stayed in Newcastle upon Tyne near Newcastle Airport (NCL) have said good things about DoubleTree by Hilton Hotel Newcastle International Airport, Britannia Hotel Newcastle Airport, and Premier Inn Newcastle Airport South. How much is a hotel in Newcastle upon Tyne for this weekend? The average price per night for a 3-star hotel in Newcastle upon Tyne this weekend is $300 or, for a 4-star hotel, $274. Looking for something even fancier? 5-star hotels in Newcastle upon Tyne for this weekend cost around $462 per night, on average (based on Booking.com prices). How much is a hotel in Newcastle upon Tyne for tonight? On average, it costs $91 per night to book a 3-star hotel in Newcastle upon Tyne for tonight. You'll pay around $107 if you choose to stay in a 4-star hotel tonight, while a 5-star hotel in Newcastle upon Tyne will cost around $150, on average (based on Booking.com prices). Which hotels in Newcastle upon Tyne are good for couples? These hotels in Newcastle upon Tyne are highly rated by couples: Maldron Hotel Newcastle, Motel One Newcastle, and Crowne Plaza Newcastle - Stephenson Quarter. What are the best hotels in Newcastle upon Tyne near Metro Radio Arena? Some of the best hotels in Newcastle upon Tyne near Metro Radio Arena include The Bar, City Vogue Apartments Newcastle, Crowne Plaza Newcastle - Stephenson Quarter and Holiday Inn Express Newcastle City Centre. Which hotels in Newcastle upon Tyne are good for families? Many families visiting Newcastle upon Tyne loved staying at Motel One Newcastle, Hotel Indigo Newcastle, and Maldron Hotel Newcastle. Which hotels in Newcastle upon Tyne have nice views? Copthorne Hotel Newcastle, Hilton Newcastle Gateshead, and Malmaison Newcastle got great room view-related reviews from travelers in Newcastle upon Tyne. Which hotels in Newcastle upon Tyne offer an especially good breakfast? 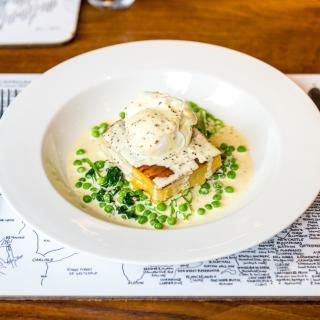 For hotels in Newcastle upon Tyne that serve highly-rated breakfasts, try Maldron Hotel Newcastle, Hotel Du Vin Newcastle, and Crowne Plaza Newcastle - Stephenson Quarter. A former Industrial Revolution hub, Newcastle has reinvented itself into a vibrant, forward-thinking city. Although no longer brewed here, Newcastle Brown Ale, or Newkie Brown, is synonymous with the city, so it’s no surprise that the nightlife is fantastic. From the O2 Academy to the Sage Music Center, the Newcastle music venues are among the best in England. The city also has a thriving arts scene, including The Biscuit Factory – Britain’s largest original art store. Equally as good is the Newcastle shopping. The Central Arcade is in an attractive Victorian building, and across the River Tyne in Gateshead is the Metro Center, Europe’s largest shopping and leisure complex. Indeed, these 2 cities have a healthy rivalry that plays out in sports, architecture and, sometimes, the bizarre. Gateshead boasts the Angel of The North, a huge statue that is already its most recognized (and controversial) symbol. While in Newcastle the Vampire Rabbit sits above a door near St Nicholas’ Cathedral. Newcastle United Football Club has the most prestigious record, but Gateshead Stadium has seen many a star compete at its international athletics meets. To the west of the city are some remains of Hadrian’s Wall and further north is Newcastle Airport. See Booking.com for a range of accommodations all over this happening city. Newcastle upon Tyne is friendly and beautiful only ten minutes by car or bus into the country side. Beautiful beaches very close. Hadrians wall castles and Vikings for those interested in history.. don’t be surprised if folks chat to you if your sitting down in the parks . If you’re a party animal then loads to do clubs of all sorts and the young are more lovers than fighters. If more mature like me there is lots of cultural things to do places to eat. Newcastle on Tyne is a lovely city that blends contemporary with traditional architecture. There is an exceptional and varied number of restaurants, bars, clubs, and things to do. The Baltic Art Museum and Lufe Center are suited to all ages. Zaap Thai Ottoman, and Sweet Dreams (dessert only) restaurants were among our favorites. An amazing place. Huge history and a wonderful welcome. Everywhere you go people talk to you, want to know where you are from, what you re interested in. There are some hidden gems like the Beamish Museum, and the centre is well invested with the Quayside and the Sage which attracts some significant acts. Well worth a visit to see the bridges and to feel the history. I know that Newcastle is an excellent venue to visit. I know that Newcastle is an excellent venue to visit. Our trip was specifically for the Dancing England Rapper Championship, which meant the we were based solely in Ouseburn and mainly at The Cumberland Arms. Eat at Ernest's. An excellent area of Newcastle to be! Had no extra time to visit the attractions and landmarks listed below. Such a beautiful quaint city. Such a beautiful quaint city. Every street has a ton of restaurants/cafes/pubs there is always something to do. The people are so friendly and the city is very safe and easily accessible. I would recommend this city to everyone. A very friendly city and the centre is walkable. A very friendly city and the centre is walkable. 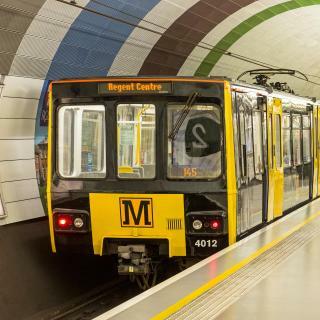 The metro and bus links are very easy to use if needed or to travel further afield. The shopping is excellent and varied as is the excellent choice of cafes and restaurants from well known chains to independents. We only stayed for one night as it was a quick visit to attend a university open day but we were very impressed with what Newcastle has to offer. Everyone is so friendly. Last minute booking. Was stuck in Newcastle because of railway disruption. This hotel is right opposite of the railway station- great location really. City centre & riverside are in short walking distance. Plenty of nice restaurants around this area. Although it is in a noisy area(with a lot of bars nearby), it’s actually a very quiet hotel with very good security. Felt quite safe and comfy to stay here. Location of the hotel was spot on, as we attended an event at the Sage venue. Only a 5 minute walk to it, from the hotel If you want somewhere to stay near to the sights and nightlife of Gateshead and Newcastle, book up at the Ramana Encore. Friendly staff and clean room at a reasonable price too. I would definitely recommend the hotel and would also say here again if an occasion needed an overnight stay. We have stayed here before so we didnt hesitate to book it again when we were visiting newcastle again. Convenient for city centre and local attractions ( life science centre, Echo Arena ). Clean and modern hotel with friendly staff. Liked the fact that breakfast was included in the price, which isnt always the case with other hotel chains. Cheap parking next door too. Not much different from other Easyhotels. Location is great, not far from the Central Station (train and metro) (10-15 minutes walk) and the quayside. Staffs are friendly. A lot of restaurants and pubs nearby. Beautiful location on the Quays, very clean hotel, rooms were lovely and the beds were so comfy! Well worth staying here, staff were so friendly and helpful! Friendly staff in a great building centrally located. If there is a better hotel in Newcastle i haven’t found it. Although the hotel is a bit tired, the staff were very friendly and helpful. The room was spacious and clean. This hotel is one of the best that Newcastle has to offer and I’m from Newcastle!!! Very close to Newcastle station and city centre. Hotel was modern and clean. Very clean hotel and the breakfast was excellent. Best hotel experience we have in UK. 1- very kind and best staffs in reception, restaurant and ckeanero. Sharing smiles and offer help every time, 2- we asked for baby cot before we came. But not available at the time of check in, however, they apologize and upgrade my room to the best family room they have.what a nice view and kind of them. They know thier mistake but upgrade me. 3- excellent and delicious English breakfast with nice service. 4- room storage for luggages available even we you made check out. 5- 24 hours reception. 6- I did extend my stay with a new booking, and they agreed to stay on my upgraded room . What a nice experience with this hotel. . The room was excellent very clean comfortable & roomy. The breakfast was fine with a good selection of food all according to how hungry or your preference. All the staff we dealt with were extremely helpful and friendly. Hotel well placed for local restaurants and attractions. Location, comfort, perfect for a brief stay.